Transport Tariff remain same despite hike in Disel Price in Odisha, you can now book car rental in Odisha with prices of 2013 in 2014. Please find hereunder the transport updated rates for this season. Vehicle/Driver/Amenities/Local expertise at your disposal. Service Tax of 4.95% applicable on the above tariff. Meet & Greeat on arrival, parking, toll, driver allowance are included in the packaged price. Vehicle shall be entitled with in the area of travel as mentioned & at disposal. Minimum 250 Kms are being charged on per day basis for outstation trips. 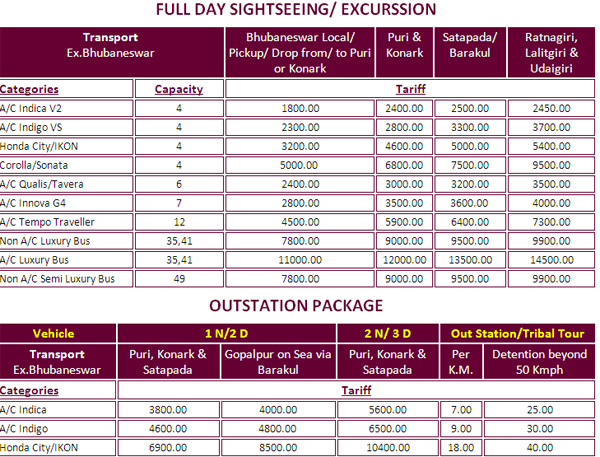 If you have not decided yet or wants to customize tour itinerary or hotels listed above in "Insight Holidays Lowest Car Rentals in Odisha Puri Konark", then we can change the travel itinerary and make a personalized, tailor-made holiday package, especially for you. We can modify this travel package as per your itinerary, budget, duration and the tourist places you would like to visit, including transportation and airfare should be included or not. Please fill the form below to contact us.